Nothing says forever like a lifetime supply of meat. Proposals are a chance for grand gestures and extravagant pranks, like faking your own death so your girlfriend realizes how empty her life would be without you. C’est l’amour. 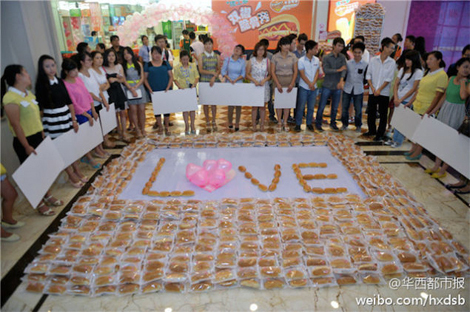 But instead of a generic flash mob or stadium screen proposal, 28-year-old Wang Han popped the question by spelling out the word “love” using 1001 hot dogs, reports Kotaku. Wang enlisted the help of a hot dog sponsor to pull off the meaty scheme. And while tube steaks might strike you as a particularly odd and unsentimental medium through which to express your eternal affection, upon closer inspection it becomes apparent that this young man is in fact a Jedi master of romance. Here’s what he got right. It doesn’t matter that Wang proposed using a phallic foodstuff with the shelf life of a rebound fling, or that he begged for his paramour’s hand in what looks like a shopping mall. What shines through is the sheer effort required to plan and execute something of this scale, as well as the canny business mind (hello corporate sponsorship) situated atop that big old heart. He referenced their first meeting. 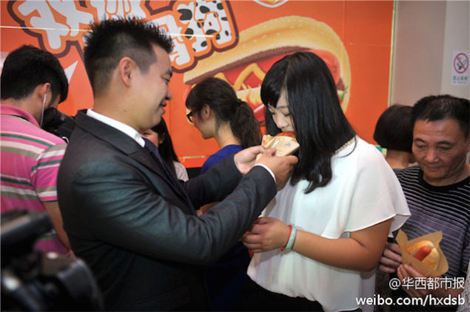 The couple, who are both originally from Chengdu in China, met three years prior in a hot dog bakery in Thailand. Relationship origin stories are important, and on a first date you should always take note of small details (like what song is playing and what underwear you’re wearing) since that stuff is potentially page one of the fairy tale that is your undying love. Wang used 1001 hot dogs to represent the 1001 days he and his girlfriend have known each other. That’s called symbolism, which is an essential component of poetry, which is when you mangle language because you’re in love. So it’s no surprise that the lady said yes to his protein-rich, over-the-top proposal; what mortal woman could refuse such starry-eyed sentimentality?